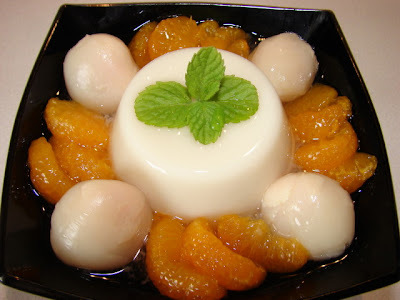 Almond tofu is the Chinese version of panna cotta but much much healthier without the heavy cream and vegan friendly. Almond tofu in Chinese is 杏仁豆腐 read as 'sin ren do fu' in Mandarin or 'hung yen dou fu' in Cantonese. 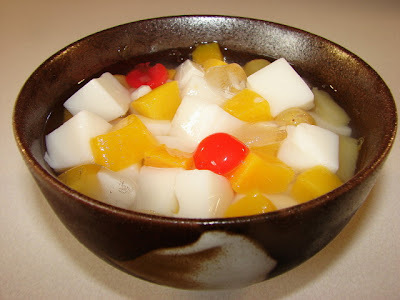 This is a Cantonese cold dessert great for the summertime. Most Cantonese dim sum restaurants will have this dessert on their trolleys whizzing around you with all the other tempting dim sums. 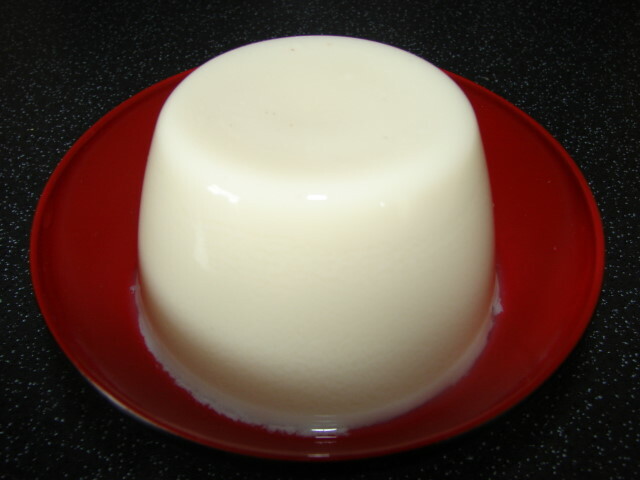 Most recipes use milk and almond essence to make the tofu or jelly, normally set with agar. 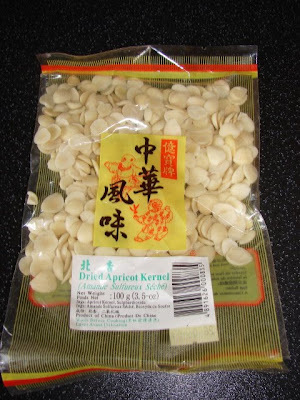 My recipe uses real sweet almonds and flavoured with Chinese bitter almond or apricot kernels. I used soy milk instead of milk. * If you cannot find Chinese bitter almonds you can use few drops of almond essence. If you hate the almond flavour you can leave the bitter almond or essence out. *Agar strips are easily available in most Oriental grocery stores. You can also use agar powder but I am not sure how much you'll need to set the liquid to a medium soft solid. Put both almonds together in a bowl and soak with 1 cup warm water for 2 - 3 hours to soften them. I use the soaking water later, it has a nice almondy fragrance. Soak agar strips with some water for about 20 - 30 min. Drain off the water and chop the agar into small pieces. Soaking and chopping the agar strips will dissolve easier when heated. Put almonds, the soaking water and the remaining 3 cups of water together in a liquidiser and blitz for about 1 minute or till the almonds are pulverised to very fine pulp. If you use a small liquidiser cup, blend in two batches. 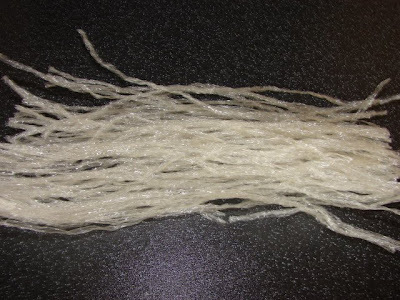 Filter the almond milk with a muslin or cotton bag see soy milk making or a large piece of muslin. Squeeze out as much milk as you can. The remaining pulp should be quite dry. You can throw it away or use to make cake or add to bread mix. I have a cake recipe to use this pulp. See recipe later. Put the almond milk and soy milk in a pan, add soaked agar. Heat and stir till agar has completely melted (when you don't see any more translucent agar strips). Sweeten with enough sugar, stir to dissolve. Pass the mixture through a sieve if you like to ensure the mixture is without any unwanted solids. Pour mixture into containers. Can use small pudding containers, jelly moulds or two larger rectangular/square boxes ( I used plastic lunch box). Remove any froth/bubbles floating on top. The almond tofu will set when cooled to room temperature. Keep in fridge till cold before serving. To remove the almond tofu from the mould. Use a cocktail stick, glide it around the edge. Then tap it hard against a serving plate or bowl to pop it out. Serve with any fruits you like, fresh or canned. This picture I served it with canned lychee and mandarin with some of the juice/syrup. To make it pretty garnish with a sprig of mint. Lychee juice (syrup) is very tasty with almond tofu. For fresh fruits I like a mixture of different sweet melons. Sour or sharp fruits I find don't compliment the subtle flavour of almond tofu very well. The other way to serve it is cut the almond tofu into small cubes. Mix with fruits, in this case canned cocktail fruits (like how they serve in restaurants) and some crushed ice to keep it really cold and refreshing. Almond and cherry cake - Sorry no picture. I made the cake but forgotten to take a picture before it was eaten! The almond pulp should be touch dry and not wet. If you don't like cherries you can leave them out or replaced with other dried fruits. Cream the butter with sugar. Add one egg at a time, in between add in a little flour to blend. Mix till all eggs are added and flour mixed in. Stir in the almond essence or lemon zest. Mix in almond pulp. Add enough milk to make a dropping consistency. Pour mixture into a greased or lined 20 - 21cm round cake tin. Smooth the top. Sprinkle on handful of almond flakes. Preheated oven, bake at about 165 - 170 deg C for about 1 hr - 1 hr 1o minutes. Test with skewer to ensure cooked through before taking it out to cool. I love almond jello! Looks like a good recipe for vegans! I usually use Knox unflavored gelatin and whole milk (which would not make it vegan). I love it how you make your own almond milk! I can't seem to get my brain around the texture of tofu in savoury dishes (with the exception of hot & sour soup). But as a dessert, I'm liking the sound of this, thanks. Thanks for the recipe. Will make some soon!! Isn't it dangerous to eat bitter almonds because of the cyanide inside them? I don't think this amount is going to kill you. I am still here, been eating this kind of almonds occasionally all my life. Bitter almond is also available in extract for cakes. And have you had Amaretti cookies and Amaretto liqueur? If you are worried leave it out.